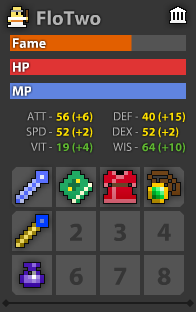 There is this game I play (rotmg) and on the forums there are people that sell In Game items for Signatures and many of them pay a lot of In Game items. When I saw this opportunity I tried getting (paint.net) back on my computer because I had previous knowledge of the GUI but I couldn't because there is this error that cease me from completing the download. I had to start using (gimp) which I am still a beginner at therefore I am wondering if interested people can help me complete some request. If you play the game and can make signatures we will split the price evenly. IF you want to start playing the game then google it and test it out then we can split the price. My dream is to acquire +10 willing subjects to assist me in this endeavor. Once the limit is completed I will create a simple forum/irc room/google documents request form to make the process faster. In fact I have seen several people try to create groups but fail at it because of disorganization. If you assist me in this I promise you it won't fail, in fact I hope it thrives and grows. -*if you play the game* wealthiness. educational term so the images won't be needed ASAP. I will make a specific note saying some things might take more then several days or even weeks to complete. No, if you desire then feel free to do so. not to participate in the game then that is his choice. I could help out... You have gotten me into the game and I don't see any harm in it so why not? Alright that is one person.